Demographers and gerontologists have provided extensive analytical and statistical data from a historical perspective (Bond et al, 2001) and much of this literature focuses on the demographic phenomenon in the post Second World period. The significant population increase in the period 1946-1964 is often referred to as the baby boom years (Willets, 2010) and consists of two spikes of activity in birth rates, one in the immediate post war years from 1946 – 1948 and the second a prolonged period extending from 1958 through to 1964. It is the first cohort of individuals who are now advancing into their 60s that are having an impact on the health and social care provision in society today (Audit Scotland, 2013). There is no consensus regarding the cause of the baby boom and many social scientists suggest a complex mixture of economic, social and psychological factors (Andersen, 1995). The vast majority of it appears to have occurred not through an increase in family size but rather through a sharp decline in the proportion of women choosing to remain childless (Raeside and Khan, 2007). For many older women these were births postponed during the Depression and World War II (Macunovich, 1999). Consequently many of these births are accounted for by the immediate 1946 – 48 spike in population and are associated with returning troops at the end of the War (Bean, 1983). This phenomenon has also been noted in other countries and internationally; there is a wide diversity in the patterns exhibited by the population increases in different countries. Macunovich (1999) provides a series of graphs that evidences how the baby boom has affected each country in the developed world. 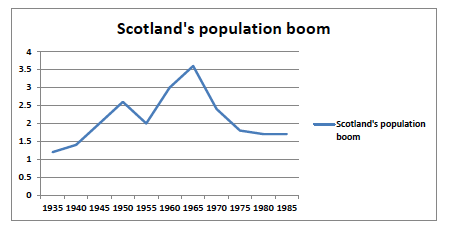 In Scotland, the graph (Figure 2) demonstrates a spike of activity in the immediately post War period, however it also demonstrates a more significant spike starting in the early 60s which reaches a second peak in 1965. Despite the ageing population being a triumph of the 20th century (Joseph Rowntree Foundation, 2011), the growth in the number and proportion of older people has been as a result of not just increased birth rates but also of lower mortality rates and the successful management of conditions that previously would have shortened life expectancy. The General Registers of Scotland record that in 1900 the average life expectancy was 40; in 2004 that had risen to 74 for a male and 79 for females. By 2010 this had risen again to 75.8 for a male and 80.4 for a female. There is agreement that the health status of individuals aged 65 and over is improving and the general health of the older population is good (Bell and Bowes, 2010; Jacobs et al, 2012). Healthy life expectancy [the average number of years that a person can expect to live in “full health”, excluding the years lived in less than full health due to disease and/or injury] figures demonstrate that the areas with the longest life expectancy (usually also those with the highest numbers/proportions of older people) also have the longest healthy life expectancy and consequently those individuals have less need of health and care services (POST, 2006). The advancements in medical expertise and technology have also provided the opportunity for people to live longer with complex health conditions. Conditions such as coronary heart disease, stroke, diabetes, asthma are often long term and require on-going medical care, and limit what a person can do. In Scotland, it is estimated that 65% of the over 65 population has reported some form of long-term illness, health problem or disability with a 35% reporting two or more conditions (Scottish Government, 2013). In the over 75’s these figures rise to 67% and 36% respectively (ISD, 2004). The Long Term Conditions Action Team (2004) reported that most people with long term medical conditions also have other complex needs leading to disabilities that require care from other sources such as social care. The Long Term Conditions Alliance (2010) recently published figures suggesting that two million people in Scotland were living with one or more long-term condition. Procter et al (2012) argues that the number of individuals living longer with chronic, long-term conditions will increase markedly in the forthcoming years and that this will also have an impact on the delivery of health and social care services. Consequently, one of the main reasons why an ageing population is a cause of concern is that it has increased the size of the cohort that is dependent on health and social care which also increases spending (Raeside and Khan, 2007). The following section will now consider the wider economic implications of the ageing population.